I've only put a few of the wedding pictures on My London Diary, mainly ones that show the setting rather than the people, but family and friends can e-mail me - or contact Raihanah & Sam - for a link to a much larger selection. We booked into a cheap(ish) boarding house for a couple of nights a short walk from the centre of Cambridge, where my elder son and his wife were to have their civil wedding ceremony on the Sunday. 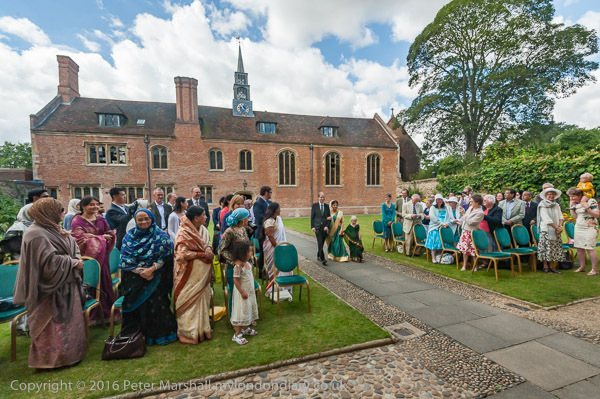 The ceremony was in Cambridge as Raihanah grew up there and they were married in a religious ceremony a few months ago at a Bangladeshi restuarant just outside the city, but the civil ceremony was in Magdalene College. Sam had spent a year at Clare, but it wasn't possible to arrange for the ceremony to be there on the dates they wanted. I'm no wedding photographer, but I'd been asked to take the pictures and had agreed to do so, but was a little apprehensive. Though I've done a few weddings for friends and my younger son before and I think the results had been fine, this was a somewhat more impressive venue. And that it was to be a dry event didn't help, though I have to say the fizzy whatever was pleasant enough. But somehow it didn't seem quite so powerful to toast people in something non-alcoholic. But it turned out to be such a friendly and welcoming venue, with the two registrars and college staff all a pleasure to work with, and I really enjoyed taking the pictures, even the few formal ones that I'd been told were required. I'd recommend it if you want a fancy setting for a wedding and can afford it. Linda and I got married at her church and I think all we had to pay was the marriage licence - which I seem to recall then was cheaper than for a dog. The only small problem was that I was unable to be in the large group taken from an upstairs window; for the smaller formal groups where I was required to be in the picture I simply set up the camera and handed it to one of the other guests to press the button, and fortunately that worked more or less. The wedding wasn't entirely conventional and included some fine opera singing and a speech by the bridegroom's mother and brother after the meal (halal of course, which restricted the choice of menu) and after coffee and wedding cake those of the guests who could stay joined bride and groom in three large punts for a trip on the Cam, with a commentary from a surprisingly knowlegeable and entertaining man wielding the pole. It was then time to say goodbye to guests and the happy pair - and they did look happy - and find a pub to drink a pint to their health. The UK branch of National Committee to Protect Oil, Gas, Port-Power and Mineral Resources in Bangladesh held a rally in Aldgate against a joint India/Bangladesh coal-fired power station planned for Rampal, just to the north of the Sundarbans UNESCO World Heritage site, the world's largest mangrove forest, home to Bengal tigers and other rich wildlife. Indian coal would be shipped in up-river through the forest, and this traffic and effluent from the plant would cause severe environmental damage. The deal violates agreed environmental guidelines and is widely opposed in Bangladesh. The rally expressed solidarity with protesters marching to the Prime Minister’s Office in Dhaka today, who were attacked by police with tear gas and batons. News reports say around 50 were badly injured and at least six arrested. Later we heard that the violence against the protesters had been more serious than was reported by the media. 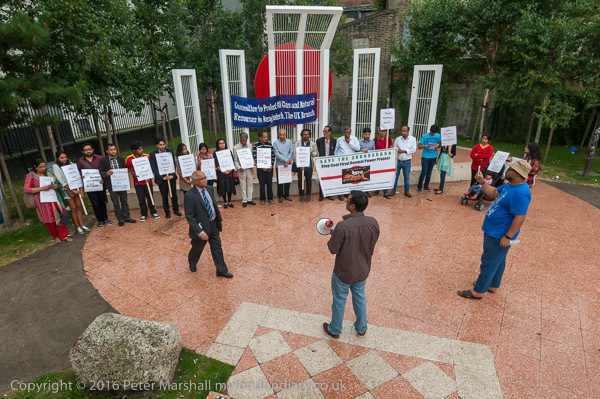 A rally in the City of London on the 50th day of the longest industrial dispute in the history of the City of London demanded that the two workers sacked at 100 Wood St be reinstated. The strike by cleaners belonging to the United Voices of the World union employed by anti-union cleaning contractor Thames Cleaning at the CBRE managed offices has already achieved the London Living Wage for workers. Supported by Unite the Resistance, the Haldane Society of Socialist Lawyers, the National Shop Stewards Network and others, the cleaners protested in Wood St before marching to the CBRE offices at St Martin's Court where they protested noisily outside the staff entrance on a busy pedestrian way near St Paul's Cathedral. Eight days later as the next protest was scheduled the union gained a satisfactory settlement and the protest was called off and the strike ended. 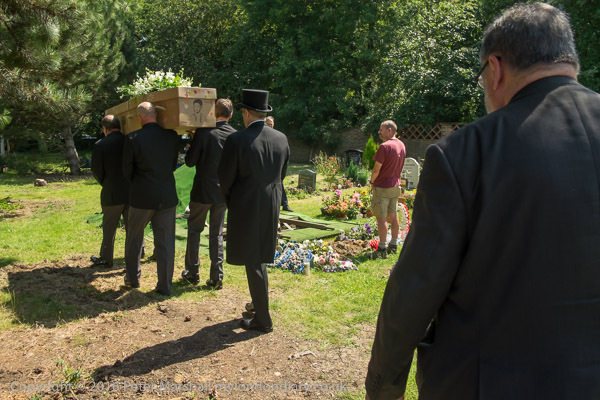 I attended the funeral of friend and photographer Townly Cooke who I first met around 30 years ago. We met many times over the years and worked together on various projects including his Greenwich book. Contact me if you want to see more pictures from the funeral. As Parliament debated giving the go-ahead to the replacement for the UK's Trident nuclear submarines, a crowd protested on Parliament Square at a rally organised by CND. Speakers included MPs and other politicians, peace campaigners and others who stressed that the independence of Trident and the idea of deterrence were myths and the use of nuclear weapons was illegal and immoral. The replacement would cost over £200 billion, and the weapons have no strategic value and will almost certainly be obsolete before they are brought into service. Protesters say their use would be illegal, totally immoral and their use would have a devastating effect on life on earth. Speakers included several SNP MPs from the SNP, Hywel Williams of Plaid Cymru, Diane Abbott, Deputy Green Party Leader Amelia Womack, Unison Assistant General Secretary Roger McKenzie, Andy Greene of DPAC, Lindsey German of Stop the War There were speakers from Left Unity, NUS, Quakers, Pax Christi and a final speech by CND Vice-President Bruce Kent. Money spent on Trident was a tremendous waste when so much more could be done with it for jobs, health, education and climate change and a doctor gave a chilling description of the effects of a nuclear bomb. There was a very different atmosphere from that in Hyde Park as people relaxed in a sunny Parliament Square after the march from the BBC organised by the People's Assembly and Stand Up To Racism against austerity and racism and calling for and election soon to defeat the Tories. There were a number of speeches from the top of the FBU fire engine at the side of the square at a rally chaired by Romayne Phoenix of the People's Assembly and Sabby Dhalu from Stand Up to Racism, including by two Islington councillors, Michelline Safi Ngongo, who had brought a message from Jeremy Corbyn, and Green Party London Assembly member Caroline Russell. Other speakers included Weyman Bennett from Stand Up to Racism, Lindsey German of Stop the War, Sam Fairbairn the National Secretary of the People's Assembly, Zita Holbourne of BARAC and PCS, Rob Williams of the NSSN, NUS Vice President (Further Education) Shakira Martin and Antonia Bright from Movement for Justice who also brought an asylum seeker to speak. Less than a hundred EDL supporters had turned up at Marble Arch to march a few yards down Park Lane and then into Hyde Park for a rally. A few anti-fascists who had turned up to oppose them had mainly left to join the People's Assembly-Stand Up to Racism march by the time I arrived. Police had stopped traffic at Marble Arch as I got there and were escorting the group down Park Lane. There were several times as many police as marchers in the area, but their was only a loose cordon around the march. After going a couple of hundred yards down the road they turned off into Hyde Park, where police had organised an area with barriers around it for their rally. As they reached it, they refused to go into the pen, and there were some heated arguments with the police. 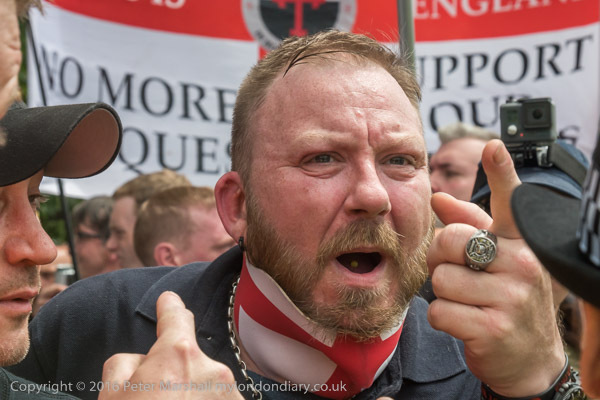 Eventually the EDL stewards calmed down the others and they agreed to hold their rally in front of the pen instead of inside it. The rally continued with a large police presence surrounding it, and more under trees a short distance away, probably four or five times as many as the protesters. The rally was going ahead peacefully until a woman passing by shouted 'Black Lives Matter' and was manhandled roughly away by stewards as police watched but did not intervene. I'd soon had enough and left to go to the rally in Parliament Square. 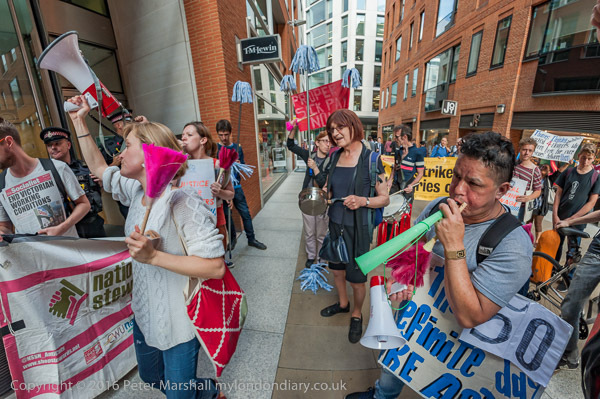 When the People's Assembly / Stand Up To Racism march set off, a small group of striking cleaners from 100 Wood St and supporters left to stage a flash mob protest at the nearby HQ Offices of CBRE in Henrietta Place. The United Voices of the World strike at Wood St for the living wage and reinstatement of sacked workers was then in its 38th day. I arrived late as I'd stopped on Regent St to photograph the marchers, and when I got there I could see the protesters inside the foyer through the large glass doors and windows, but the doors were locked. I took a few pictures through the glass, but when the doors were opened to let the protesters out I was able to go in and photograph them for a short time before they all left to rejoin the People's Assembly march. 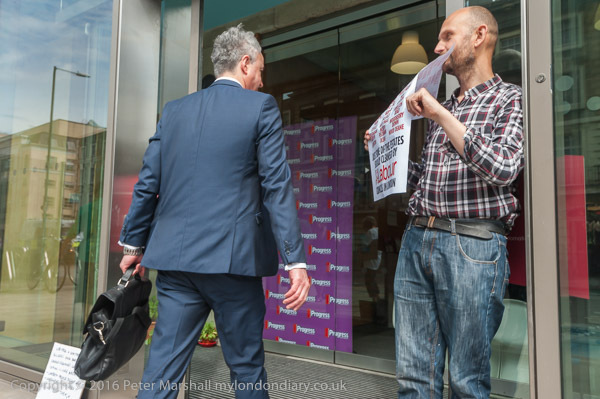 As well as several of the cleaners the protesters included United Voices of the World General Secretary Petros Elia and Bakers Union (BFAWU) National President Ian Hodson. After photographing them through the glass door and windows I was able to get inside and take a few pictures before they left to rejoin the march. End Austerity, No to Racism, Tories Out! 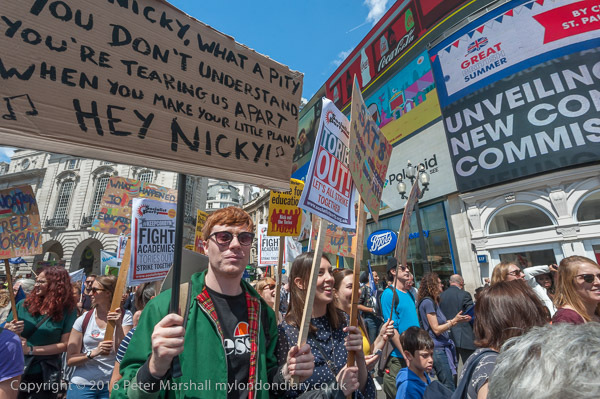 The march and rally was organised by the People's Assembly and Stand Up To Racism as an emergency demonstration following the referendum against austerity and racism and calling for the Tories to be defeated at a General Election. The march met outside the BBC in the forlorn hope that they might for once cover a protest in Britain properly. Many marching and at the rally showed great support for Jeremy Corbyn as our next prime minister - and the only hope of a future for the Labour Party. There were also many on the march showing solidarity with refugees and asylum seekers and protesting against the upsurge in racism and hate attacks provoked by the referendum campaign and vote to leave Europe, which was largely conducted by Brexit campaigners on an anti-immigration platform, although it is far from clear that leaving the EU will reduce the number of people coming to work here and make their valuable contribution to our economy and society. After photographing the several thousands forming up next to the BBC I photographed the start of the march and continued with it a little way down Regent St where I waited until I could see the end of the march before rushing off to cover two other events before rejoining the marchers at their rally. 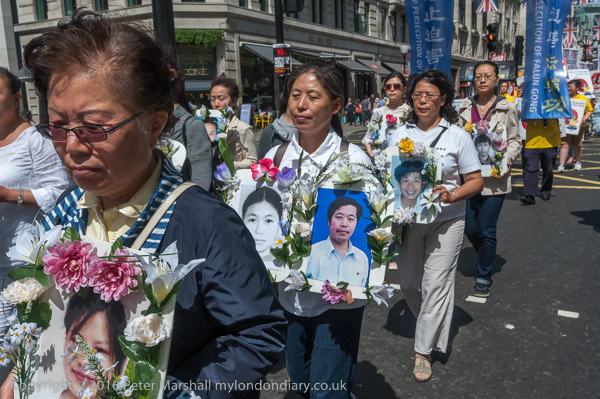 Practitioners of Falun Dafa (also known as Falun Gong), an advanced Buddhist practice of moral rectitude, meditation and exercise founded by Mr Li Hongzhi in 1992, marched through London to protest the continuing torture and repression they have experience in China since 1999. Practitioners in China are subject to forced labor, psychiatric abuse, torture and even execution, allegedly carried out to supply human organs for Chinese transplant operations. Some on the march carried pictures of the martyrs and others had large banners against the persecution. There is a small permanent 24hr protest opposite the Chinese Embassy which has continued for a number of years. 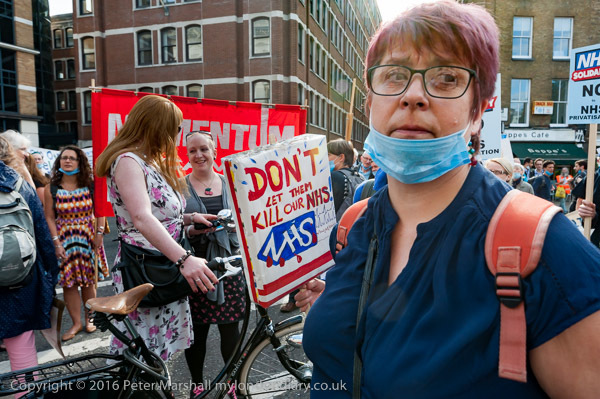 Healthcare workers and supporters dedicated to saving a publicly funded, delivered and accountable NHS met outside St Bartholomew's Hospital and after a short rally marched behind the FBU fire engine to St Paul's Churchyard. Here people sat down on the large expanse of pavement and there was a longer rally with speakers including Matt Wrack of the FBU. The event was organised by NHS Solidarity. 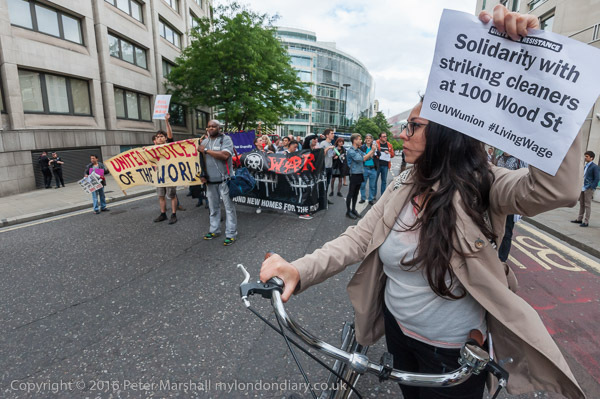 A rally in the City of London supported cleaners belonging to the United Voices of the World union employed by anti-union cleaning contractor Thames Cleaning at the 100 Wood St offices managed by CBRE. The strike is now the longest running industrial dispute in the history of the City of London and the protest was supported by Unite the Resistance, the Haldane Society of Socialist Lawyers, Class War and others. After a rally opposite the offices in Wood St, the protesters marched around the block and held a rally blocking the street outside the CBRE offices at St Martin's Court. While members and supporters lobbied MPs at Parliament, CND members held a Mad Hatters Tea Party on Parliament Square against plans to replace Trident at a cost of at least £205 billion. 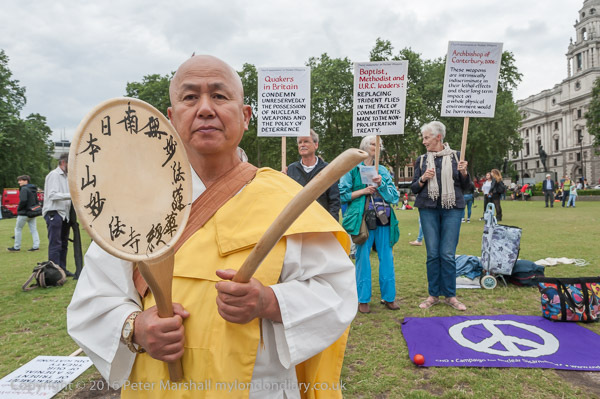 Christians stood with placards stating the opposition by churches of the different denominations to the replacement, and Buddhists from the Battersea Peace Pagoda added their support. Disabled protesters and their supporters carried out a series of actions around Westminster on their '#PIPFightback' National Day of Action against the Personal Independence Payments which have been a totally inadequate replacement for the Disabled Living Allowance which provided support to enable to work an live on more even terms with the rest of the community. Mental Health Resistance Network (MHRN), Disabled People Against Cuts (DPAC) and Winvisible (Women with Invisible and Visible Disabilities) and other supporters met outside the Victoria St offices of Capita PLC, one of the companies responsible for PIP assessments (along with the discredited ATOS) where there were a number of speeches on the busy pavement before the protesters moved on to the road to block it and continue their rally there. Shoddy assessments by Capita and Atos, many of which are overturned at tribunals months later, has led to many losing essential support. The assessments themselves are flawed, they make no allowances for many variable conditions and fail to take account of medical evidence. After a few minutes during which a long queue of traffic built up (though protesters moved quickly at one point to let an ambulance drive through) Paula Peters announced to the protest that it was time to move on and the protesters marched along the road past the Met Police HQ at New Scotland Yard and on the the DWP offices at Caxton House. Here they again stopped for speeches, blocking the road for some minutes before continuing to Parliament. There was a short rally on the road outside the HOuses of Parliament and then the protesters decided to move down the road to College Green, where a media village was set up with politicians being interviewed on TV over the appointment of a new Prime Minister. Police stopped them going on to the green, which although often open to the public is a part of the Parliamentary estate and often, like today is roped off for media use. One protester jumped up onto the grass and refused police requests to move, and a few minutes later others joined her. Eventually the police allowed protesters to stand on a path in the middle of the area. All of the TV crews present on College Green will have seen and heard the protest, but only one or two bothered to come across and find out what was happening and film it, though the protest will have been visible in the distance in some broadcast interviews. Protesters from various campaigns to save the NHS held a protest in support as Labour MP for Wirral West Margaret Greenwood presented a 'Ten Minute Rule Bill' with cross-party support to stop the privatisation of the NHS and return it to its founding principles. 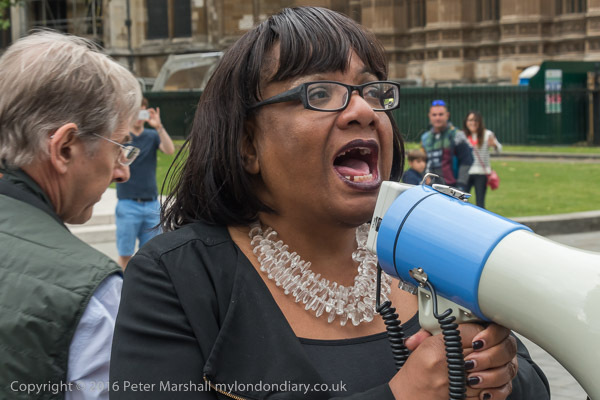 Labour Shadow Health Secretary Diane Abbott came out to speak in support at the protest. 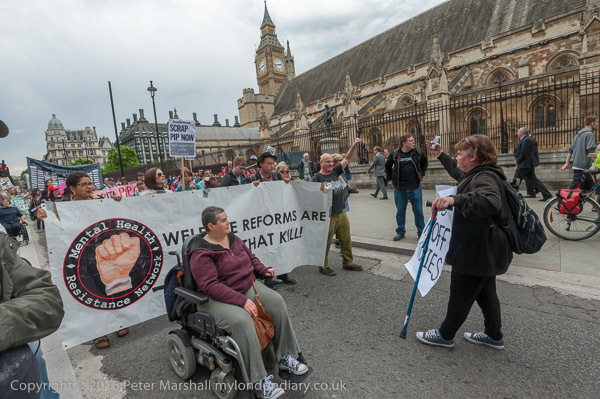 One of around 20 protests around the country by disabled protesters and supporters took place at the Vauxhall PIP Consultation Centre in Vauxhall, one of the centres where ATOS carry out sham Personal Independence Payments 'assessments' on behalf of the DWP. Faulty by design and conducted without proper consideration of medical evidence and with a financial incentive to fail claimants, these sham assessments mean that many genuine claimants lose essential benefits for months before they are restored on appeal. Many become desperate and this sometimes leads to hospitalisation or suicide. The centre where the protest was held was in a back street and relatively few people came past, though most who did showed an interest and took flyers. There were a number actually coming to the centre and some people driving past who stopped to see what was going on. Among those taking part in the protest was Gill Thompson, whose brother David Clapson, a diabetic ex-soldier died in July 2013 after his benefits were 'sanctioned'. He was left starving without money for food or electricity to keep the fridge containing his insulin running. Benefit sanctions are often imposed for trivial reasons as DWP workers can be themselves disciplined if they do not meet targets. She is crowd-funding to try and get a full and public enquiry into the reasons why her brother and others like him with severe mental of physical health problems have been sanctioned and to ensure a fairer system for vulnerable claimants. 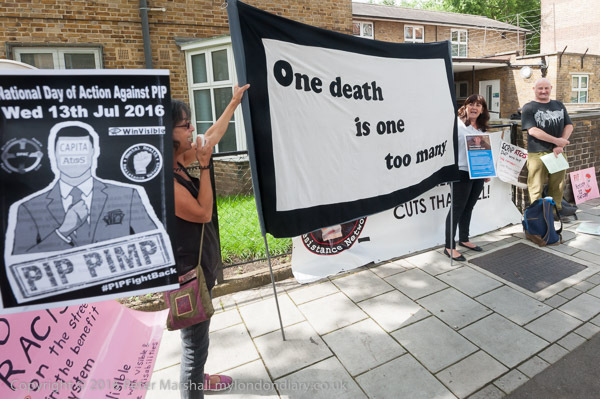 She is holding a banner with the message 'One death is too many' and on the reverse it has the names and a few pictures of around 100 claimants known to have died because of sanctions. This appears to be a relatively small fraction of the total which runs into thousands. We took a short walk around Harmondsworth Moor in the Colne Valley Park, 260 acres of reclaimed land near Heathrow Airport established by British Airways close to their Waterside HQ building. 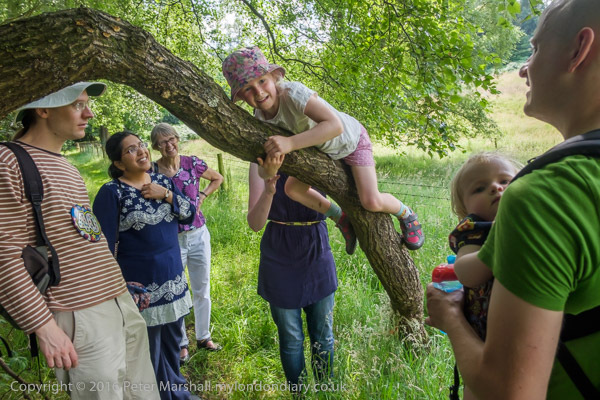 Harmondsworth Moor is the largest public park to be created in London for the past 100 years. British Airways offices are in one corner of the park, and probably they had to make lots of promises to get permission to build - and perhaps this park was one of them. Most of the open space around here is green belt, and doubtless this area, after having been left a derelict tipping ground with the odd lake following gravel expansion was thus designated. Any hill in this part of Middlesex is either a railway bridge or landfill - and the railway is in the industrial estate on the other side of the M25. 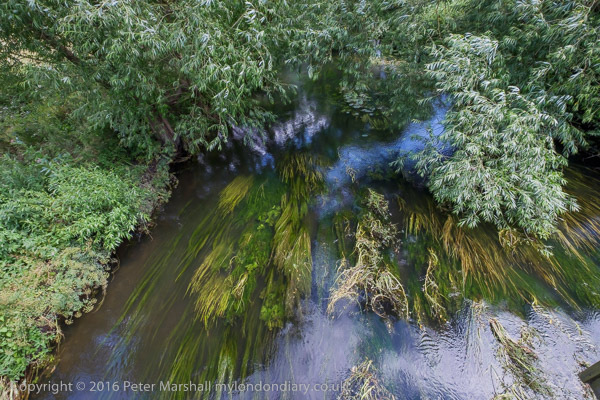 Three rivers cross the moor (and there is Bigley Ditch along the west side by the M25), all streams of the Colne. The Duke of Northumberland's River was an artificial cut dug around 1530 to take water across to his mills at Isleworth as the flow from the River Crane was not reliable enough, and it divrts from the Colne in the north of the park. A little further east is the River Colne itself, then the Wraysbury River, which leaves the main stream a little north of the M4, which may be a natural distributary of the Colne but was more probably dug well before the Norman invasion to power mills; it's occasionally still called be the older form of its name, the Wyradisbury River. It rejoins the Colne in central Staines to run into the Thames, though some of the water goes west along the Polyle Channel to join the Colne Brook, another stream of the Colne which leaves the main river in Uxbridge and runs into the Thames at Wraysbury. I think I've rather simplified the situation - and a little further south (and north) it does get more complex. But our walk took us across three rivers, and then up an artificial hill which gives good views of the M25 and is decorated with some of the larger stones from the old Waterloo Bridge, replaced by a largely female workforce during WW2, and back across them and along the road back into Harmondsworth, where we ate a good straightforward (and relatively cheap) pub meal. Housing action group Focus E15 who in previous years have been assaulted and ejected from the Mayor's Newham Show today temporarily occupied the balconies of the former Police Station close to one of the entrances in protest against Newham Council's housing failures. Earlier the group had set up a protest stall around the corner on the busy Barking Road, speaking out and leafleting pedestrians and motorists stopped at the traffic lights, many of whom were on their way for the second day of the 'Mayor's Newham Show' held in Central Park. It's perhaps indicative of Mayor Robin Wales and the monolithic Labour administration that although paid for by the people and owing its success to the work of all of them that the event is even named as a PR exercise for the Mayor. Focus E15, started by young mothers facing eviction and removal from London after Newham Council axed the grant to the hostel they were living in, have been protesting against the council's policy of social cleansing for the last two years, widening their personal campaign into a 'Housing for All' campaign against Newham and other councils who are failing in their duty to provide housing for ordinary people across London. 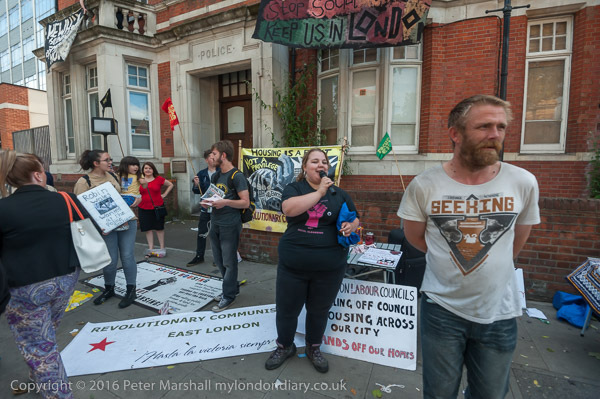 Backed by the East London Revolutionary Communist Group, their weekly street stall in the centre of Stratford, high profile protests and occupations and defence of people threatened with eviction have put housing and social cleansing firmly on the national agenda. Speaking out against evictions and attacking the council's failure to provide adequate housing in Newham for long-term residents while hundreds of council homes have been empty for over ten years and the council encourages the building of huge areas of luxury flats for overseas investors and rich newcomers has not made Focus E15 popular with Robin Wales and Newham Council. Attempts - including the ludicrous 'arrest' of a table, arrests of Jasmin Stone, physical assaults and intimidation have failed to stop their protests. As they have been prevented from handing out leaflets inside or outside the Newham show in the past two years, this year they set up their stall a short distance away, and, after a hour or so, moved on to the empty former Police Station opposite Newham Town Hall on the road leading to the show ground. Two pairs of people had used a ladder to climb to the balconies on the front of the building and hung banners over them, while the protesters held a rally outside. Among those who came and spoke was a woman from East End Sisters Uncut who talked about their occupation of an empty property in Hackney as a community resource. Police came and had a look at the protest, and told the protesters that they were worried about the safety of the two balconies, which looked in good condition to me. When told that the protesters would leave before very long when the rally finished they went back across the road and watched from there. 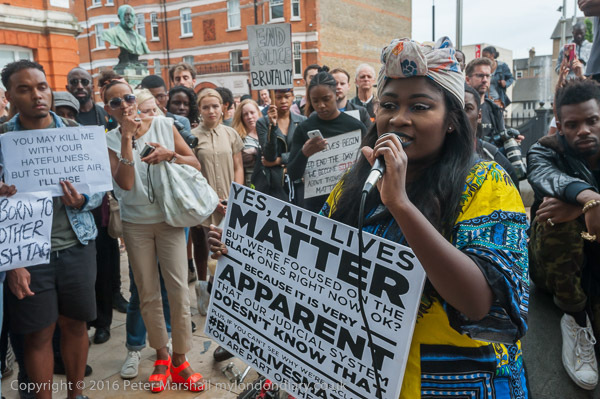 Local black organisers in Brixton called a rally and march in Memory of Alton Sterling and Philando Castile and to show solidarity with those murdered by police brutality, both in the US and here in the UK. The rally took place outside the Tate Library on Windrush Square, under the gaze of the bust of Sir Henry Tate, one of the great Victorian philanthropists, who gave Brixton its library, opened in 1893. His money came from sugar, a Caribbean resource he exploited, though he only entered the trade in 1859, after slavery had been abolished. This part of the square used to be the Tate Library gardens, but these were largely destroyed to widen the roads. The area was renamed Windrush Square on the 50th anniversary of the arrival of the Empire Windrush, and was remodelled into its current bleakness (Windswept Square) in 2010 to discourage drug dealers, drinkers and people generally from making use of it. What had been intended to be a short rally before a march past Brixton police station and around the area showed no sign of ending as I left, with speaker after speaker coming to the open mike in Windrush Square to express their feelings and call for positive action for justice. Brixton Police station has been the scene of a number of black deaths in custody, including that of Sean Rigg, Wayne Douglas and Ricky Bishop, and one of the organisers who spoke wore a t-shirt listing just a few of those who have been killed by police in the UK, with young black men in particular being far more likely to die after arrest - or to be shot rather than arrested. 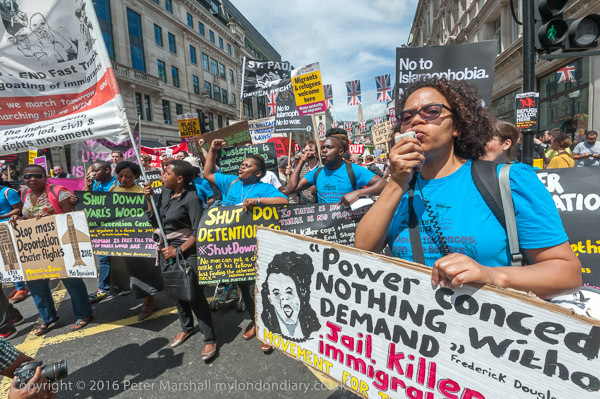 Last year police stripped the tree in front of the police station of its deaths in custody memorials on the day of the annual march in central London against deaths in custody. The protesters did march some time after I left, and brought traffic to a halt in Brixton for several hours. Several hundreds came to picnic in Green Park and debate the future under Brexit, with most of those attending feeling cheated by a vote that was based on lies and false promises, but wanting to find ways to make it into something positive for the country. As I arrived, many had split into small groups spread out across the park to hold serious discussions about various aspects of the future. There was a small group of Brexit supporters who had come to counter the protest with their own picnic for democracy organised by Spiked magazine, and when some of those who had been at the 'Rise Up For Europe' Downing Street rally arrived with their placards, some of them came across and picked an argument. This became a little personal when one a woman from the 'Spiked' group accused those holding the placards of being unwashed, and there was some vigorous speaking in response. 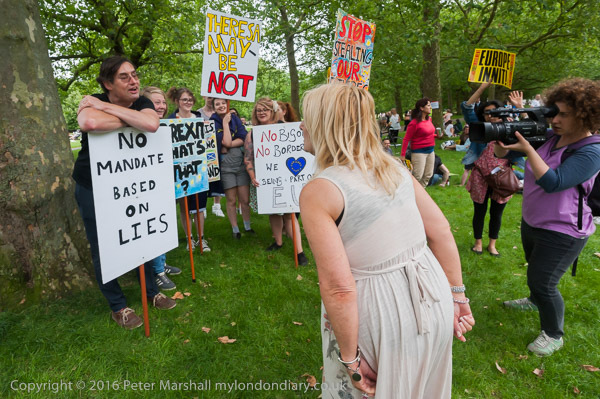 But people from both sides stepped in to cool things down, and there was then some fairly good-natured attempts by each side to compete with their placards for a group of photographers and video cameras which the argument had attracted. 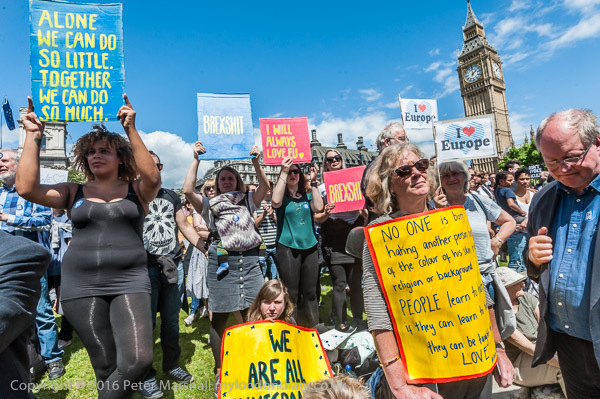 'Another Europe Is Possible' hosted a rally at Downing St come to the climate of fear and hatred after the Brexit vote, calling for an end to scapegoating of migrants and Islamophobia. They want to keep Britain open to migrants, and for policies and media which recognise the positive contribution that migration makes to the UK. 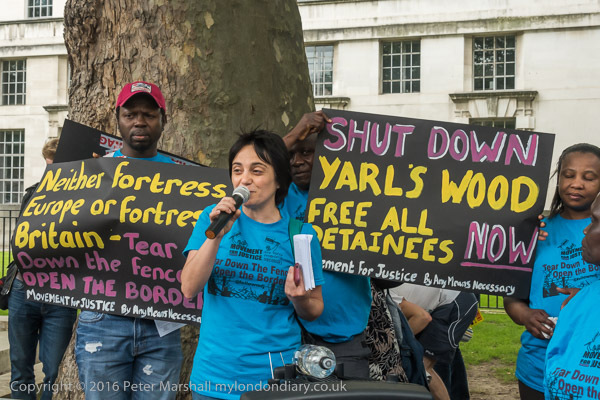 I arrived late, as Anna Pichierri of Movement for Justice was talking about the increasing success of their campaign for justice for migrants and to protest against Yarl's Wood and other immigration centres which they hope will soon be shut down as a result of their growing campaign. Other speakers included Joseph Healy of Left Unity and Syrian activist Muzna Al-Naib who challenged the UK for its failure to take any action over the atrocities of the Asad regime or offer real support to the Syrian people, Asad Rehman of Friends of the Earth and Newham Monitoring Project and Sabby Dhalu from Stand Up To Racism. The Brexit vote led to an immediate increase in racist attacks, but hate crimes have been encouraged over the years by the climate of scapegoating of migrants and media Islamophobia as well as the persistent targeting by police of the Black community for stop and search and the continuing activities of fascist groups. At the end of the rally many left to attend the Brexit picnic and discussion in Green Park. In their first action since Sisters Uncut set up area groups, women from East End Sisters Uncut met at Hackney Town Hall and demand Hackney Council abolish all plans to demolish council homes, refuse to implement the Housing Act and invest money into council housing and refuges for victims of domestic violence. Currently 60% of women seeking places in refuges in Hackney are turned away as there is no room for them. 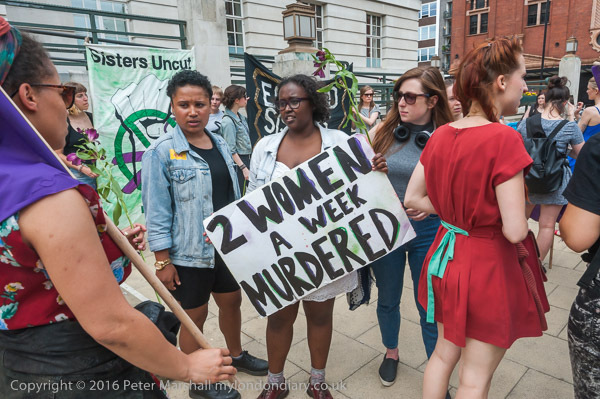 After I left the women occupied an empty council property in Hackney to draw attention to the lack of available council houses for women fleeing domestic violence and to use as a community space. Hackney Council claim that the figure they gave earlier this year of 1,047 empty council properties was incorrect, and told the Hackney Citizen (who strangely described the protest as 'rowdy') that the true figure was 440, of which 144 were described as 'uninhabitable'. They claim to be replacing the 915 council homes they are demolishing with a larger number of new council homes and to have increased their spending on domestic violence. Sisters Uncut quote a Women's Aid report for 2013-5 which found that over 60% of applications to women’s refuges in Hackney are refused as no room is available. Protesters against the demolition of council estates and their replacement by luxury flats under 'regeneration' schemes by London Labour councils including Southwark, Newham and Lambeth make their views known to council leaders arriving for a 'Progress' Labour conference 'Governing for Britain'. The Blairite New Labour scheme, now accelerated by the Tory Housing and Planning Act, makes London too expensive for ordinary workers leading to social cleansing, while making excessive profits for developers, including housing associations and estate agents Savills. The protesters, from the Revolutionary Communist Group, Focus E15 'Homes for All' campaign and Architects for Social Housing, have been involved in campaigns against demolition of the Heygate and Aylesbury estates in Southwark, Newham council's attempts to sell off the Carpenter's estate in Stratford, where good homes have been left empty for over 10 years despite a desperate housing crisis with a huge housing waiting list, Lambeth's plans to demolish the Central Hill Estate and many other similar shameful attacks on council housing where working-class residents are being forced to move out of London, with new homes being sold to overseas investors and the rich in a process of social cleansing. Among them were women evicted from the Focus E15 hostel in Stratford by Newham who wanted to rehouse them in run-down private rented accommodation in Hastings, Manchester and elsewhere who stood their ground and refused to leave London. Protesters against the 'Garden Bridge', a private green space to bridge the River Thames close to Waterloo Bridge, which Lambeth Council have supported despite the vast cost of £175m for little public gain, protested outside the Labour Party 'Progress' movement 'Governing for Britain' conference which Lambeth council leader Lib Peck was attending. 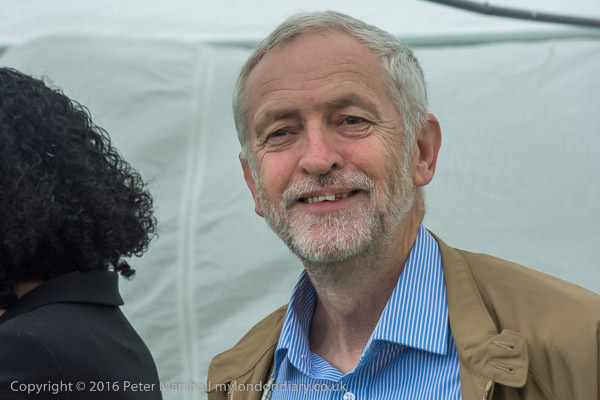 Critics say 'Progress' is an ironically named group within the Labour Party that supports the discredited Blairite New Labour agenda which lost the party the last two elections, and is one of the groups leading the attempted coup against Jeremy Corbyn. The 'Garden Bridge' has been widely criticised as a complete waste of money and resources that would not provide a useful link across the River Thames. It will be run by a private body that will severely restrict activities on it and limit access. 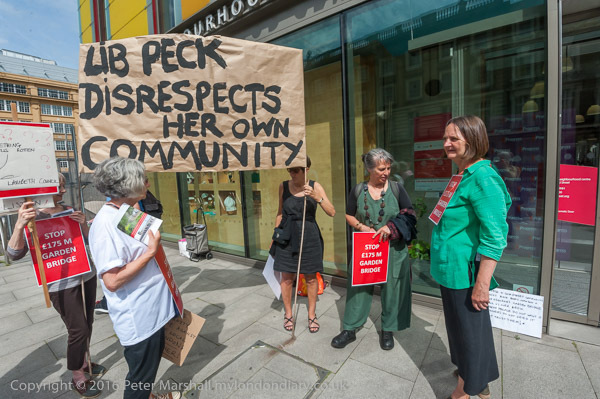 The protesters complain that Lambeth Council and its leader Lib Peck have failed to listen to the views of Lambeth residents against the scheme. 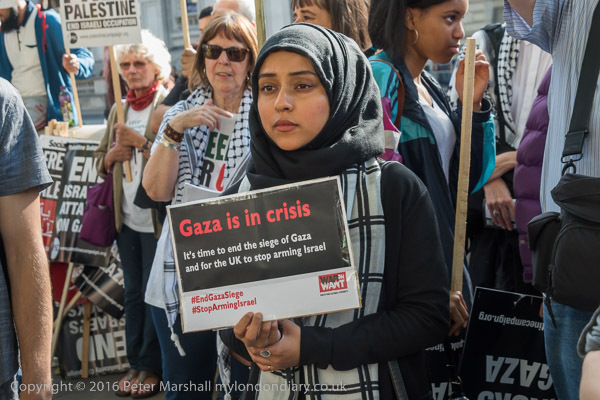 A protest at Downing St calls for an end to Israel's almost ten year siege on Gaza, and an end to the UK's arms trade with Israel. There have been three major military assaults by Israel military forces on Gaza in the last 8 years, resulting in thousands of Palestinian deaths, and making the small area, home to 1.8 million people, mainly refugees and their families virtually uninhabitable. The blockade prevents materials needed for reconstruction reaching the area. A handful of pro-Israeli activists came to the protest, some wearing Palestinian keffiyeh scarves in an obvious attempt to infiltrate and started to hand out leaflets. They were quickly surrounded by angry protesters, and had to be protected by stewards and police, who persuaded them to continue their protest a few yards down the road, where they stood facing and trading insults and gestures with a few of the protesters largely unnoticed while the speeches went on. Soon after a group of anti-Zionist Neturei Karta Jews arrived and formed a line between the protest and the Zionists who were incensed by their presence.They argue that the Jewish religion teaches that Jews should not set up a separate state until the Messiah comes and that Palestine should be returned to the Palestinians. Among the speakers introduced by Sara Apps Interim Director of the Palestine Solidarity Campaign were Chris Rose, Director of Amos Trust, Elizabeth Jadon, speaking for the Israeli Committee Against House Demolitions UK, John Hilary, Executive Director War on Want, Bruce Kent, Riya Hassan, European Coordinator BDS (Boycott, Divestment, Sanctions) national committee, Glyn Secker, Jews for Justice for Palestinians and captain of one of the boats which attempted to break the Israeli sanctions, Mizan Rahman of Campaign Against the Arms Trade, Joyce Onstad from the Lib Dem Friends of Palestine and Kamal Hawwash, Vice Chair of the Palestine Solidarity Campaign. Many listening were left in tears after a moving performance by Shahd Abusalma, a journalist and singer from Gaza. 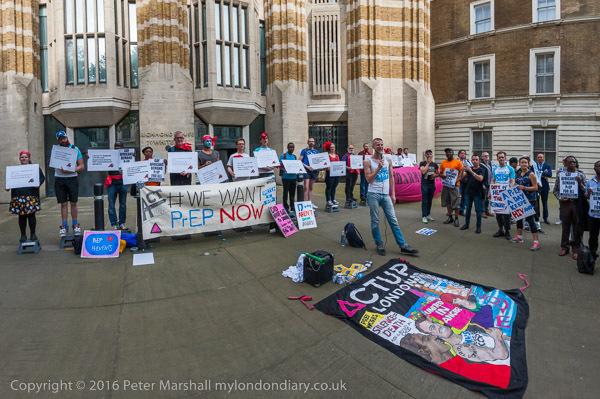 ACT UP London, I Want Prep Now, National AIDS Trust, Terence Higgins Trust, Out and Proud Diamond Group and others protest outside the Dept of Health in Whitehall calling for the NHS to provide Pre exposure prophylaxis (PrEP) which is almost 100% effective in preventing HIV transmission. Currently 17 people are diagnosed here with HIV every day. NHS (England) claims PrEP is a public health strategy and they will delegate it to local authorities, a decision currently subject to judicial review and which will result in a postcode lottery for provision. Seventeen protesters wearing red ribbons stood in a row on low steps holding posters which spelt out some of the reasons why people become HIV positive. 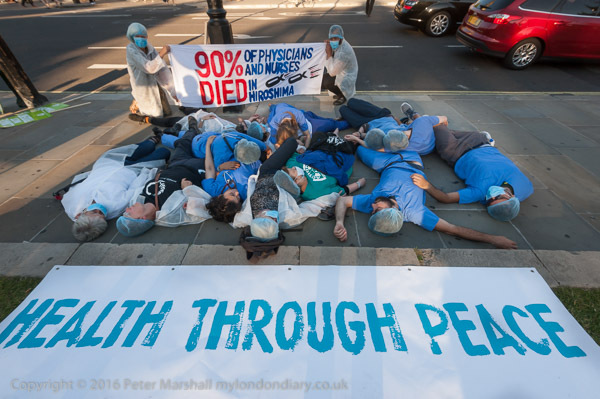 After a number of speeches, some of the protesters staged a die-in on the pavement and wrote slogans 'PrEP NO!' and '17 a day = NOT OK!' in blue chalk. They drew around some of those lying on the ground. After all the protesters had got up, they moved closer to the Dept of Health building and threw the blue chalks at it, before further chalking on the pavement. Anti-war protesters outside the QEII Centre on the morning the Chilcot report was being published demanded that Tony Blair who lied and deceived MPs and the British people to wage an illegal war on Iraq should be impeached as a war criminal. The report, published after a 7-year delay, confirmed most of what anti-war protesters have long said about Blair, and even revealed some new areas where Blair misled public and Parliament. It confirmed that the decision to go to war had been taken many months in advance between Bush and Blair. 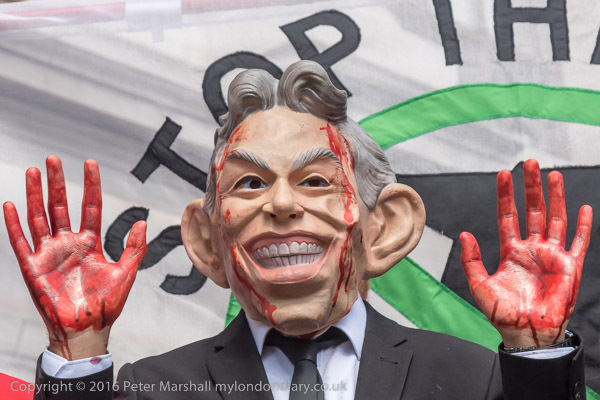 Protesters now demand that Blair be put on trial as a war criminal. Among the speakers was MP Caroline Lucas, who had been reading the huge report since being allowed access at 8am. The protest started with a naming of a few of the dead, with people coming up to read 5 names of UK forces and 5 of Iraqi civilians who died because of the war. It was only a token gesture, as over a million Iraqis are generally acknowledged to have lost their lives, and was ended with a longer speech by SNP MP George Kerevan. Among others taking part in the event were several from Veterans for Peace, veteran peace protester Bruce Kent, CDN Chair Kate Hudson, comedian Jeremy Hardy and Stop the War Convener Lindsey German. Among the more vocal protesters were a number from Global Women's strike, and there was some street theatre involving two men with Blair and Bush masks and very bloody hands (and a lot of oil revenues) with two judges in wigs and red robes. Police made a nuisance of themselves by insisting on keeping the minor road by the side of the QE2 where the protest was being held open to traffic in both directions, although there was very little actual traffic and it would have caused hardly any disruption to close it. Neither pavement on either side was really wide enough for the number of protesters, and photographers certainly resented the unnecessary orders to get off the road that police repeatedly made. There was one small incident where protesters objected to a pro-Israel religious fanatic dancing Irish jigs to loud music and disrupting the protest. He attends many protests and makes a nuisance of himself. Eventually police did persuade him to move a few yards away done the street to avoid clashing with the protest, but only after some loud arguments with police by protesters. NUT members hold a rally in Parliament Square after their march through London on the day of their strike against cuts in government funding and the increasing deregulation of teachers' pay and conditions through the increasing pressure on schools to become academies. Speakers included John McDonnell MP and Kevin Courtney, Acting General Secretary of the National Union of Teachers. NUT members taking strike action against cuts in government funding and the increasing deregulation of teachers' pay and conditions through the increasing pressure on schools to become academies march through London from the BBC to a rally in Parliament Square. The starting point was chosen as the BBC in the hope that the BBC might notice that teachers were striking and give some coverage to the march. It did get a little coverage, but nothing that really discussed the real issues behind teacher and parent discontent. Conservative policies are aimed at breaking up the system, and are partly based on previous failed Labour policies. Sussex Friends of Israel, Zionist Federation and the Israel Advocacy Movement hold their 'It’s Time To Stop The Hate: Stand With Israel,' rally close to the US embassy as a counter-demonstration to the annual Al Quds Day march in London which calls for an end to the Israeli occupation of Palestine. 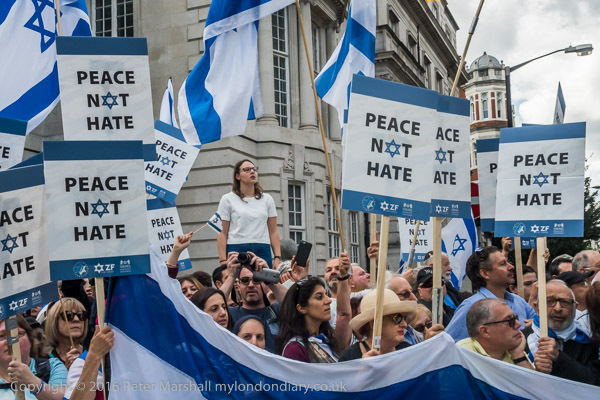 Several hundreds of people waved Israeli flags, shouted and held placards calling for 'Peace Not Hate' as the march arrived, with large numbers of police keeping the two groups apart. There was loud and extremely angry shouting when they saw the anti-Zionist Neturei Karta Jews standing facing them from a wall in front of the embassy. Earlier a small group carrying Israeli flags had harassed the Al Quds Day march on its march to the embassy through London, but had been kept at a slight distance by police. The annual Al Quds Day march in London calls for an end to the Israeli occupation of Palestine. Several thousand Palestinians and Muslims from around the country, as well as activists for Palestinian freedom and Neturei Karta Orthodox Jews who reject Zionism and the Israeli state marched from the BBC to a rally at the US Embassy. A few supporters of Israel tried to protest against the march, holding Israeli flags and shouting at the marchers, but police kept them away. Outside the embassy they were met by loud opposition from several hundred supporters of Israel, who claimed to be standing for peace, and who shouted particularly loudly at the anti-Zionist Jews when they stood on a wall facing them from a distance. 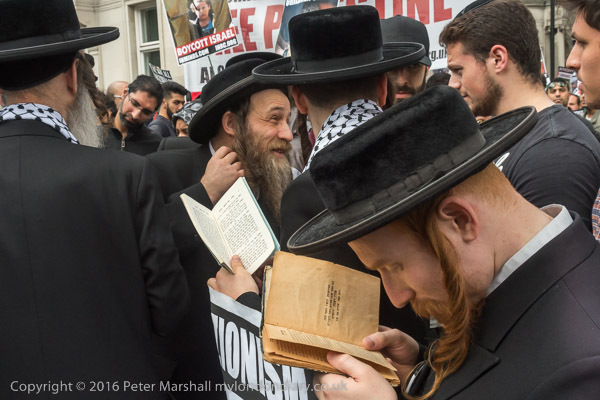 Clearly both the pro-Israel protesters and the Neturei Karta Jews were shouting anti-semitic comments at each other. 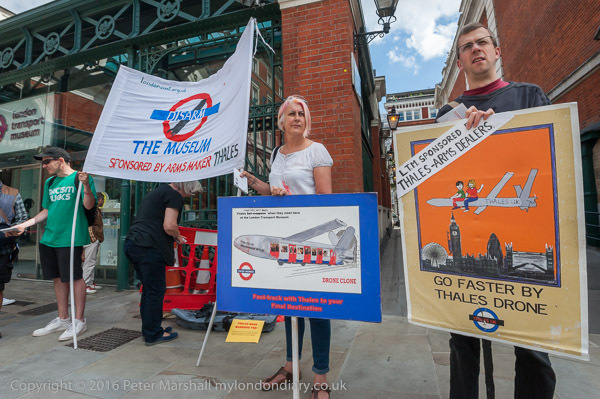 London Campaign Against Arms Trade (CAAT) picket the London Transport Museum in Covent Garden demanding it end its sponsorship by the twelfth largest arms company in the world, Thales, which supplies missiles, drones and other military products, and has sold to repressive regimes such as Saudi Arabia, Russia, Colombia, Kazakhstan and the UAE. 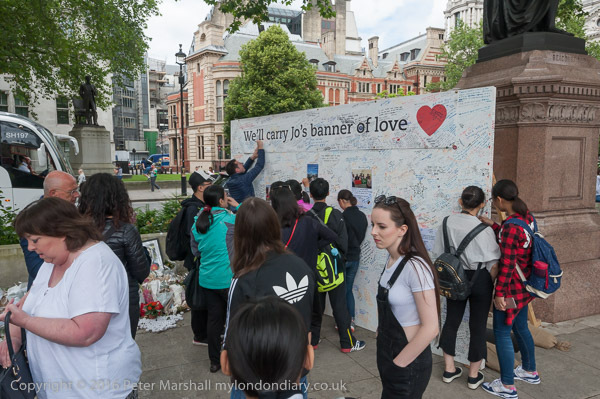 Few of those coming to write on the board remembering Jo Cox will actually have heard of her before her tragic death, but the cold-blooded murder outside her constituency office has affected all of us through the media reports. Clearly she was a woman who came into Parliament to do what she could for the people she knew and for the area she had grown up in, something fairly rare in politics these days. 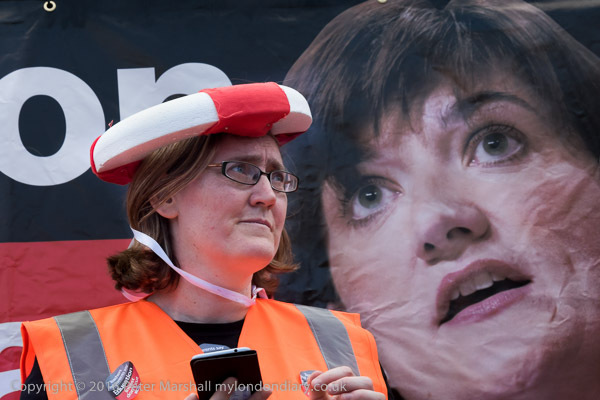 In particular she will be remembered for her support for refugees, speaking up for them in Parliament when many older and more established MPs held their breath or voted against them, either because they lacked compassion or were scared of antagonising some of their racist constituents. 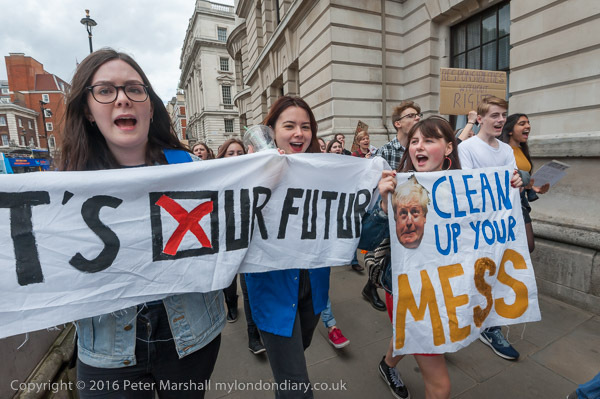 Several hundred protesters, mainly 16-17 year-olds, met in Trafalgar Square on Sunday morning to express their outrage at not being allowed to vote, particularly following the EU referendum, which will impact their future most and where a vote by their age group might have altered the result. After a short rally they marched down to Parliament Square where there was a longer rally. Most of the many speakers at the open microphone were teenagers taking part in the protest. I left the march at Green Park as the rear of it passed, around 90 minutes after the front of the march and too the Jubilee Line one stop to Westminster. There the rally following the march had started some time earlier, and I only heard the final couple of speakers. Marchers were still arriving when the rally finished. 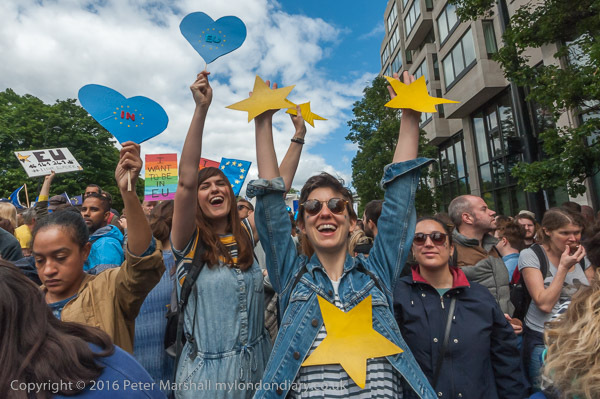 More than 50,000 people marched through London to a rally in Parliament Square to show their love for the EU and in protest against the lies and deception from both sides of the EU referendum campaign. Many feel that the result did not truly reflect the will of the people and that the majority was too small to be a mandate for such a drastic change. As a reaction to the increase in hate crime against racial, faith and other minorities following the Brexit vote, Islington Labour Party called a 'Say No to Hate Crime' Rally in Highbury Fields. Speakers at the event included local MPs Jeremy Corbyn and Emily Thornberry, London Assembly members Jennette Arnold and Caroline Russell, faith leaders, including a gay Catholic priest, a leader of the Somali community, Richard Reiser of DPAC, the leader of Islington council and councillors. Islington is proud to be a diverse, tolerant and cohesive community with good relations between all who live there, regardless of race, faith, sexual orientation, disability and transgender identity, and the rally stressed the need to stand up against hate crimes and report and for any incidents to be reported to the police. As in previous months I took a number of pictures from the train of the growing buildings at Nine Elms and at Waterloo of the development of the Shell site, as well as others on my trips around London. Bus trips took me to Vauxhall too, as well as to Oxford St and Hackney, and other train journers were in Battersea and out through Earls Court and on the way through Harlesden and Kings Langley. Walking I went past Hyde Park Corner, St Paul's Cathedral, the backstreets of Lambeth and Brixton. 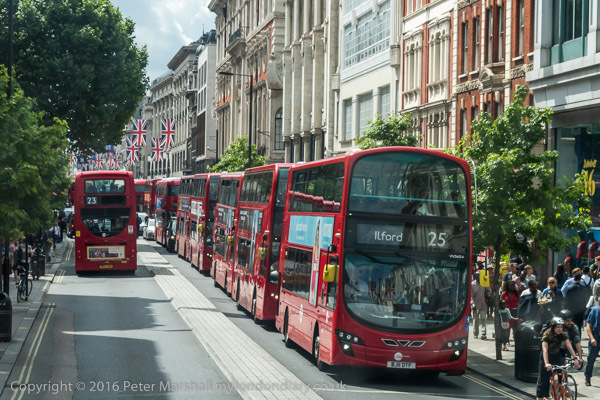 All pictures Copyright © Peter Marshall 2016, all rights reserved.